Outsource2india's transition management draws up detailed project transition plans on how to manage the transfer of our customers' inhouse processes from their environment to ours. Our transition strategy aims at accomplishing the relocation of specific operations from the outsourcing company (or the donor) to our offshore development center within the timeline defined in the service contract; with minimal or no disruption to business operations and quality of output. Effective transition management and in-depth transition planning is the key to any successful offshore endeavor. Learn more about the advantages of our comprehensive transition management process. Our transition managers enter the process much before the deal is signed to understand the customers' outsourcing vision and to evaluate the feasibility of outsourcing the process under consideration. They represent O2I's outsourcing 'face' and play a very crucial role at the onset of an outsourcing relationship. During the teething stages of a project, our transition manager interacts extensively with the customer and works towards designing a comprehensive enterprise transition plan before project roll-out. At O2I, transition management covers a series of steps, some of which continue well into advanced stages of the project lifecycle. During this stage we do an analysis of the feasibility of outsourcing as well as O2I's business competency to handle the process. Regulatory and compliance issues are looked at and risk analysis conducted. These steps help to further assess risks related to outsourcing the function and the do-ability of the project. Once the above evaluations have been completed and the outcomes are favorable to going ahead with the project, O2I designs an outsourcing solution in collaboration with the customer. The process work flow, volume analysis, costs and cyclical trends are taken into consideration while designing a solution. Our team makes sure that we leverage the best practices from previous transitions and arrive at an optimized solution from both business and IT perspectives, which is discussed in detail with the customer for final implementation. After the contract has been signed and the solution designed, we get into the nitty-gritty of planning how the process transition should take place. Giving enough thought on process transition helps us to keep to project schedules and minimal downtime during the transition period. This involves finalizing all aspects such as the composition of a new team, reporting hierarchy, shift timing details, performance evaluation measures, timelines, escalation procedures in case of disputes or issues and communication and interaction protocols. This involves detailing each step of the process as it is to occur at O2I development center. This ensures that the process transition to our environment takes place with maximum attention to outcomes, turnaround times and optimization of people and resources. The project is now rolled out for implementation. First-time projects require a lot of communication between O2I and the customer location. The transition manager's role is very crucial at this stage and goes a long way to enhance mutual understanding and partnering between the customer and O2I team. The project manager co-ordinates between facilities, IT, infrastructure, technology, HR, legal, donor teams and the offshore team to ensure that each is performing the tasks assigned to them. At O2I, we use the latest project measurement tools to track key project related metrics. Microsoft Project or Excel are used for tracking smaller sized projects and for more complex and high volume projects, our teams use Six Sigma, PMI and RPPS. Regular status-update meetings attended by both our managers and the customer help to fine-tune and drive the project forward. Our Quality teams are fed back into the process to fine-tune the functions and add value to the solution that we offer our customers. 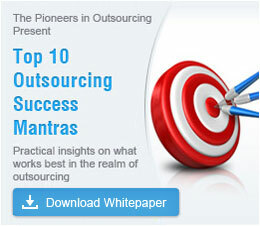 The management team at Outsource2india has years of working experience in different industry verticals. Their experience has been the driving force behind our company, enabling us to provide outsourcing solutions to customers all over the world. Contact us to know how you can benefit from O2I's seamless transition process!